Not to rub in how awesome my kids are (rub rub rub) but despite some tantrums, lack of sleep and general food dislikes, we have somehow created children that will at least try what you put in front of them. Awesome right? Well that has always excluded shellfish. (Maybe they were trying to keep kosher without me? I kid.) Well my friends we have entered into the “Beckett officially eats more food items than his sister” stage. And I’m pretty ecstatic that he chose mussels as his way to push past that hurdle. My husband and I love mussels. We choose them over most foods (besides cheese in my case and sour cream and cheddar ruffles in my husbands, blech). So while cooking for friends, which was a pseudo disaster since I’ve learned (this past weekend) that if you want a mean Goan curry or a homemade pita or a French palmier I’m your girl, but if you want a pot pie, well, it might take me a couple times. So I was making a simple clam spaghetti base and adding mussels and shrimp. Easy enough, delicious enough, right? B was trying to rip the mussels bag. What? I chalked it up to him being slightly nuts in the kitchen. Then I plated, and he grabbed at those shells like they were gold. So we handed him one. He not only opened it, but ate the meat. So we handed him another, and another. Well you get the gist. In a classic Erin moment I neglected to take a picture of the dish, but of course took one of B’s accomplishment! Here’s my recipe for an easy seafood pasta, serves 4 adults and 3 kids with a ton of leftovers! 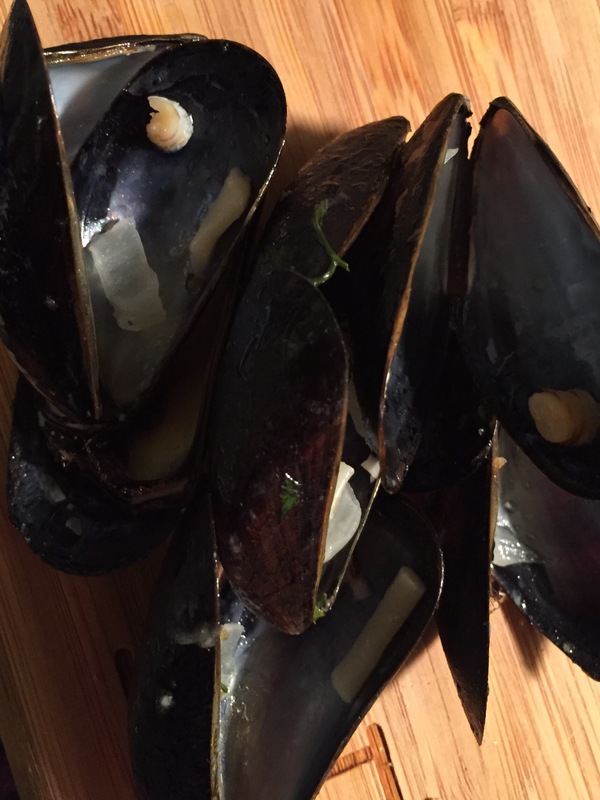 Wash your little necks and mussels thoroughly. In a sauté pan over medium heat add your butter, onions and garlic. In about 5 minutes add clam juice and white wine. Simmer for 10 minutes and cook pasta of your choice per box directions. When pasta is ready add seafood to liquid, salt and pepper. Close sauté pan tightly with a lid. in 3-5 minutes your seafood should be ready. Remember to discard any shells that haven’t opened. Toss pasta in, add parsley and lemon and serve!